The Haines and Friends Fund invites everyone to share in the 2016 Annual Exhibit of Awardees! 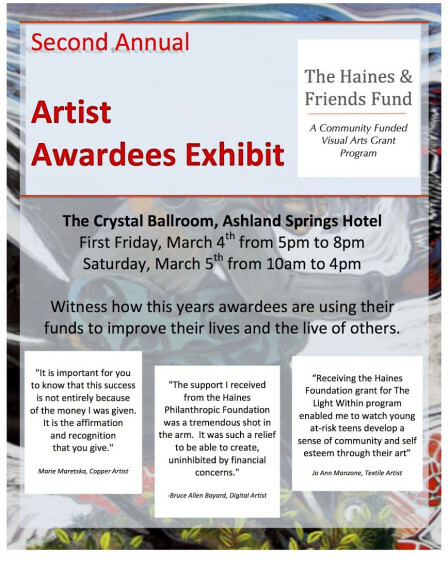 The second annual Haines and Friends Fund Awardees Exhibit is taking place this coming First Friday, March 4th through Saturday, March 5th. The exhibit will be held in the Crystal Ballroom of the Ashland Springs Hotel from 5pm to 8pm on First Friday and from 10am to 4pm on Saturday. Artwork and examples of “the use of grants funds” will be exhibited by the 18 awardees during the 2015-2016 round of funding. The Haines and Friends fund accepted artist applications in April of 2015 from individuals around our community and region. The Fund offers grant awards to southern Oregon artists and arts educators in support of the creation of artistic projects and/or art education, which might include original and new works of private and public art. Artist may use the funds to purchase supplies and equipment or to cover personal expenses of the artist and/or their art education program. In 2015, its second year of funding, The Haines and Friends Fund was able to award 18 grants to local artists from a total of 47 applications submitted. $60,000 was shared, up from $50,000 in its first year of funding, with highly qualified individuals supporting a myriad of artistic endeavors. Artists often need extra support just to buy supplies, to try something new, or to bring art to groups that can benefit. The Haines and Friends Fund would like to give the community the opportunity to show their support of the arts and this important program by opening up funding to all who wish to participate.